Kaylee (also nicknamed “Bo”) is a 6-year-old little girl who attends first grade at Parkside Elementary in Grants Pass, OR. She is an active ‘tomboy’ and loves to compete in BMX races, ride dune buggies, and loves keeping up with her two older brothers. During October of 2017, Kaylee sprained her ankle during one of her activities. At first, it seemed like a pretty normal injury. X-rays were fine, and it seemed as if some ice and elevation would heal it up in no time. Instead, her ankle did the opposite, and Kaylee started acting very lethargic. Her parents became very concerned and took her to the doctor. Kaylee’s blood was drawn, and later that day the phone call came that no parent wants to get. Kaylee’s blood work came back positive for a form of cancer called, Acute Lymphoblastic Leukemia (ALL). Kaylee was immediately rushed to Medford where she was placed on a life-flight to Portland. During the flight, Kaylee’s vital signs plummeted very quickly and she was given four blood transfusions. Once in Portland, she went in for surgery to have her port installed, and began receiving chemotherapy immediately. For 28 days, Kaylee went through intense chemotherapy, sometimes including several treatments in one day. At the end of the month, she was sent home with a strict daily medical routine. Kaylee is required to take ten different types of medication every day, including chemo and steroids. She also receives in-home chemotherapy once a week. This courageous little girl refuses to let this get her down for long. Right away, she has asked to go back to riding her bike, playing with her brothers and friends, and wanted to go back to school. Kylee has a three-year chemo plan ahead of her, but already this fierce little red-head is proving she is a fighter. Kaylee will be adopted as a Sparrow to Hidden Valley High School. 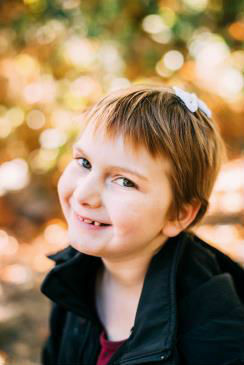 Students at HVHS will work hard to raise money for Kaylee through sponsored community service and fundraising projects.